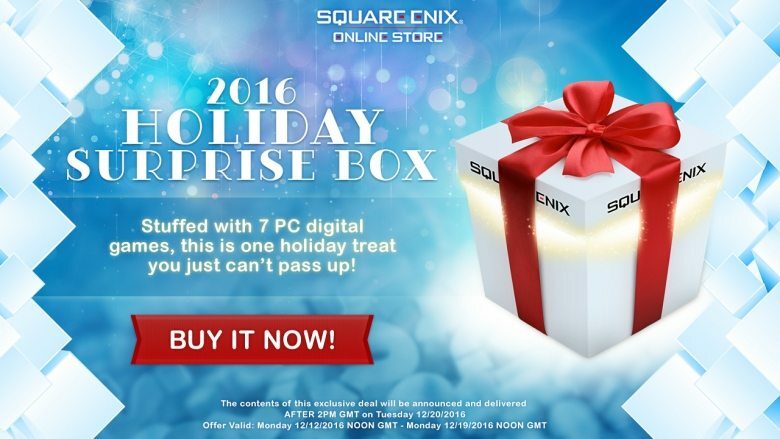 Square Enix Surprise Box Holiday 2016 – For only $9.99, get the Square Enix 2016 Holiday Surprise Box featuring over $80 worth of exciting titles for your holiday gaming needs! Not to be funny, but the banner image suggests there are 7 games in the bundle, but the description only lists 5. Or are there vouchers for the 2 remaining games? When do you find out whats in the box, soon as you purchase it? I’m debating weather the gamble is worth it. A game with reviews in the 50% range in Steam. Adding $20 to the total. A mediocre game that was only in the bundle to add $30 to the value of the total. One of the worst, most linear Final Fantasies available. A single part of a game with no gameplay, that you will be unable to finish unless you hand them more money. An MMORPG requiring you to hand them more money to continue. Discount vouchers that were completely useless. Now, consider that this was a bundle split 5 ways, and that this year’s will be split 7 ways. Your odds do NOT look good. Prepare for massive Eidos garbage. Sure you could get lucky, and they may stop fudging the price with overpriced garbage like Thief and Temple of Osiris, but don’t get your hopes up too much. All that said, I’m probably taking the risk. It’s only $10, after all. I’ve lost that on much worse. Maybe they’ll put something good in this year to re-hook all the people they’ve left disappointed in the past. Who knows, they might even wedge one of the decent Final Fantasy games into the pile of Eidos trash to make their customers feel good about their purchase. The “over $80 value” being split 7 ways is definitely worth noting. It could be, for example, one game with a regular price of $20, and the other six averaging around $10 each. Or two $20 games, and the rest averaging around $8. As such, I would expect it to include mostly older and/or lower-budget titles. And that doesn’t even guarantee that they’ll be games you like, or even all “complete” games that don’t require buying additional episodes or a subscription fee to continue playing. And of course, it’s possible they might be games that commonly go on sale for 75% off, so if you follow sales, it might only be around a $20 value to you. I suppose it’s good if you’re a Legacy of Kain fan, but I never got into it. The Hitman and Tomb Raider stuff is in there just to fluff the price value, and I’ve never even HEARD of Goetia until today. I suppose I’d better start hoping that Lightning Returns is better than Final Fantasy XIII. I don’t have high expectations at all, but maybe it will be decent enough to justify the $10 price. Edit: Just to clarify, this isn’t 7 games, it is 6 and 1/6 games. Like Life is Strange, you only get an incomplete fraction of the Hitman game. this was such a bullshitty move from them. Just for one game i refuse to give them money, id rather buy the keys to people who got conned into buying this. Anyone know what the games were? so, no Final Fantasy XV or Deus Ex Mankind Divided? I think I’ll pass on this one.